American test pilot astronaut 1994-2002. US Navy test pilot. Status: Inactive; Active 1994-2002. Born: 1961-10-24. Spaceflights: 2 . Total time in space: 19.67 days. Birth Place: Augusta, Georgia. PERSONAL DATA: Born October, 24, 1961, in Augusta, Georgia. Married to Colin James Kilrain of Braintree, Massachusetts. She enjoys triathlons, martial arts, and playing the piano. Her parents, Joe and Sue Still, reside in Martinez, Georgia. Colin’s mother, Mrs. Terry Kilrain, resides in Braintree, Massachusetts. EDUCATION: Graduated from Walnut Hill High School, Natick, Massachusetts, in 1979. Master of Science degree in aerospace engineering from Georgia Institute of Technology, 1985. ORGANIZATIONS: Association of Naval Aviation. Association of Space Explorers. The Georgia Tech Foundation. SPECIAL HONORS: Distinguished Naval Graduate of Aviation Officer Candidate School; Distinguished Graduate of the United States Naval Test Pilot School, Class 103; Awarded the Defense Superior Service Medal, Defense Meritorious Service Medal, Navy Commendation Medal, Navy Achievement Medal, NASA Space Flight Medals (2), and the National Defense Service Medal. Ten Outstanding Young Americans Award by the United States Junior Chamber of Commerce. Daughter of the American Revolution, Good Scout Award, 1997. EXPERIENCE: After graduating from undergraduate school, Susan worked as a Wind Tunnel Project Officer for Lockheed Corporation in Marietta, Georgia and earned her graduate degree. She was commissioned in 1985 and designated a naval aviator in 1987. Susan was selected to be a flight instructor in the TA-4J Skyhawk. She later flew EA-6A Electric Intruders for Tactical Electronic Warfare Squadron 33 in Key West, Florida. After completing Test Pilot School, she reported to Fighter Squadron 101 in Virginia Beach, Virginia for F-14 Tomcat training. She has logged over 3,000 flight hours in more than 30 different aircraft. NASA EXPERIENCE: Susan reported to the Johnson Space Center in March 1995. Following a year of training, she worked technical issues for the Vehicle Systems and Operations Branch of the Astronaut Office. She also served as spacecraft communicator (CAPCOM) in mission control during launch and entry for numerous missions. A veteran of two space flights, she has logged over 471 hours in space. She flew as pilot on STS-83 (April 4-8, 1997) and STS-94 (July 1-17, 1997). She most recently was the Legislative Specialist for Shuttle for the Office of Legislative Affairs at NASA Headquarters, Washington D.C. Susan retired from the Astronaut Office in December 2002 and from the Navy in June 2005. SPACE FLIGHT EXPERIENCE: Her first mission, STS-83 (April 4-8, 1997), was cut short because of problems with one of the Shuttle’s three fuel cell power generation units. Mission duration was 95 hours and 12 minutes, traveling 1.5 million miles in 63 orbits of the Earth. STS-94 (July 1-17, 1997) was a re-flight of the Microgravity Science Laboratory (MSL-1) Spacelab mission, and focused on materials and combustion science research in microgravity. Mission duration was 376 hours and 45 minutes, traveling 6.3 million miles in 251 orbits of the Earth. Born October, 24, 1961, in Augusta, Georgia. Married to Colin James Kilrain of Braintree, Massachusetts. She enjoys triathlons, martial arts, and playing the piano. Her parents, Joe and Sue Still, reside in Martinez, Georgia. Colin's mother, Mrs. Terry Kilrain, resides in Braintree, Massachusetts. Graduated from Walnut Hill High School, Natick, Massachusetts, in 1979. Master of science degree in aerospace engineering from Georgia Institute of Technology, 1985. Association of Naval Aviation. Association of Space Explorers. The Georgia Tech Foundation. Distinguished Naval Graduate of Aviation Officer Candidate School; Distinguished Graduate of the United States Naval Test Pilot School, Class 103; Awarded the Defense Superior Service Medal, Navy Meritorious Service Medal, Navy Commendation Medal, Navy Achievement Medal, NASA Space Flight Medals (2), and the National Defense Service Medal. Ten Outstanding Young Americans Award by the United States Junior Chamber of Commerce. Good Scout Award, 1997. After graduating from undergraduate school, Susan worked as a Wind Tunnel Project Officer for Lockheed Corporation in Marietta, Georgia and earned her graduate degree. She was commissioned in 1985 and designated a naval aviator in 1987. Susan was selected to be a flight instructor in the TA-4J Skyhawk. She later flew EA-6A Electric Intruders for Tactical Electronic Warfare Squadron 33 in Key West, Florida. After completing Test Pilot School, she reported to Fighter Squadron 101 in Virginia Beach, Virginia for F-14 Tomcat training. She has logged over 3,000 flight hours in more than 30 different aircraft. Susan reported to the Johnson Space Center in March 1995. Following a year of training, she worked technical issues for the Vehicle Systems and Operations Branch of the Astronaut Office. A veteran of two space flights, she has logged over 471 hours in space. 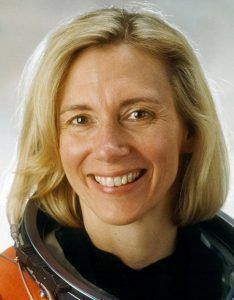 She flew as pilot on STS-83 (April 4-8, 1997) and STS-94 (July 1-17, 1997). She currently acts as spacecraft communicator (CAPCOM) in mission control during launch and entry. Her first mission, STS-83 (April 4-8, 1997), was cut short because of problems with one of the Shuttle's three fuel cell power generation units. Mission duration was 95 hours and 12 minutes, traveling 1.5 million miles in 63 orbits of the Earth. Family: Astronaut. Country: USA. Flights: STS-83, STS-94. Projects: STS. Agency: USN. Bibliography: 12, 5620. 1961 October 24 - . Birth of Susan Leigh Still-Kilrain - . Nation: USA. Related Persons: Kilrain. American test pilot astronaut 1994-2002. US Navy test pilot. 2 spaceflights, 19.7 days in space. Flew to orbit on STS-83 (1997), STS-94..
1997 April 4 - . 19:20 GMT - . Launch Site: Cape Canaveral. Launch Complex: Cape Canaveral LC39A. Launch Platform: MLP3. LV Family: Shuttle. Launch Vehicle: Space Shuttle. STS-83 - . Call Sign: Columbia. Crew: Crouch, Gernhardt, Halsell, Kilrain, Linteris, Thomas, Voss, Janice. Backup Crew: Coleman, Catherine. Payload: Columbia F22 / Spacelab LM Unit 1 / EDO. Mass: 115,900 kg (255,500 lb). Nation: USA. Agency: NASA Houston. Program: STS. Class: Manned. Type: Manned spaceplane. Flight: STS-83. Spacecraft Bus: Shuttle. Spacecraft: Columbia. Duration: 3.97 days. Decay Date: 1997-04-08 . USAF Sat Cat: 24755 . COSPAR: 1997-013A. Apogee: 302 km (187 mi). Perigee: 298 km (185 mi). Inclination: 28.50 deg. Period: 90.50 min. The launch of STS-83, the first Microgravity Science Laboratory (MSL-1) mission, was postponed for a day to replace some insulation around a water coolant line in Columbia's payload bay. Liftoff was further delayed 20 minutes due to anomalous oxygen readings in the orbiter's payload bay. STS-83 was cut short due to a problem with one of the three fuel cells that provide electricity and water to Columbia (flight rules required that all three must be operating). At 14:30 GMT on April 6 the crew were ordered to begin a Minimum Duration Flight (MDF). On April 8 the OMS engines ignited at 17:30 GMT for the deorbit burn, and Columbia landed on Runway 33 at Kennedy Space Center at 18:33 GMT. With delays in International Space Station construction leaving ample room in the shuttle schedule, NASA made the unique decision to leave the equipment installed in Columbia and refly this mission with the same crew later in 1997 as STS-94. 1997 April 8 - . Landing of STS-83 - . Return Crew: Crouch, Gernhardt, Halsell, Kilrain, Linteris, Thomas, Voss, Janice. Nation: USA. Related Persons: Crouch, Gernhardt, Halsell, Kilrain, Linteris, Thomas, Voss, Janice. Program: Spacelab. Flight: STS-83. STS-83 landed at 18:33 GMT. .
1997 July 1 - . 18:02 GMT - . Launch Site: Cape Canaveral. Launch Complex: Cape Canaveral LC39A. Launch Platform: MLP1. LV Family: Shuttle. Launch Vehicle: Space Shuttle. STS-94 - . Call Sign: Columbia. Crew: Crouch, Gernhardt, Halsell, Kilrain, Linteris, Thomas, Voss, Janice. Payload: Columbia F23 / Spacelab LM Unit 1 / EDO. Mass: 115,900 kg (255,500 lb). Nation: USA. Related Persons: Crouch, Gernhardt, Halsell, Kilrain, Linteris, Thomas, Voss, Janice. Agency: NASA Houston. Manufacturer: Bremen. Program: STS. Class: Manned. Type: Manned spaceplane. Flight: STS-94. Spacecraft Bus: Shuttle. Spacecraft: Columbia. Duration: 15.70 days. Decay Date: 1997-07-17 . USAF Sat Cat: 24849 . COSPAR: 1997-032A. Apogee: 300 km (180 mi). Perigee: 296 km (183 mi). Inclination: 28.50 deg. Period: 90.50 min. MSL-1: The Microgravity Science Laboratory included the first test of the International Space Station's EXPRESS Rack. MSL-1 also contained numerous other experiment payloads to test materials and combustion processes in zero gravity. CRYOFD: The Cryogenic Flexible Diode (CRYOFD) heat pipe was a Hitchhiker payload. OARE: The Orbital Acceleration Research Experiment was a self-calibrating instrument that monitored extremely small accelerations and vibrations experienced during orbit of the Shuttle. The mission this time went for its full two week duration and the crew completed the full list of experiments. The deorbit burn was on July 17, 1997 at 09:44 GMT and Columbia landed on KSC's Runway 33 at 10:46:34 GMT. 1997 July 17 - . Landing of STS-94 - . Return Crew: Crouch, Gernhardt, Halsell, Kilrain, Linteris, Thomas, Voss, Janice. Nation: USA. Related Persons: Crouch, Gernhardt, Halsell, Kilrain, Linteris, Thomas, Voss, Janice. Program: STS. Flight: STS-94. STS-94 landed at 10:46 GMT. .